We had an opportunity to camp at the Camp James Campground in Kernville this past week while on vacation. Situated just outside of the Sequoia National Forest and on the Kern River you can’t ask for a more tranquil and peaceful spot. From the moment we checked in, the staff was very friendly and accomodating. The campground was clean and organized in a way that was easy to get around. We opted for “full hookups” off the river, spot #33 and were pleased with the site. The campground is right on the Kern River and there are quite a few sites right on the water, none of river sites have sewer hookups but have water and electric. The river was running way above normal due to all of the snow this season so it was a little louder than normal but was very nice being close to. We cooked out for almost every meal, the wood provided at the campground was pretty green so difficult to get lit but once you got a fire going it stayed burning pretty well. I would recommend using some kindling if you have it. They also provide ice and snacks in the office which was very convenient. The showers were about 100 yards from our site, you do have to pay $1 for about 7 minutes of hot water but a small price to pay for a clean shower that is well kept. You can get quarters for the shower in the office. We did a rafting trip one afternoon down the Kern river. The starting point was right up the road from the campground and it was about a 60 minute ride, just right for my kids (ages 9 and 17). Mostly class 2 with some class 3’s. There are class 4’s and 5’s if you choose to go a little further up the river on another package. 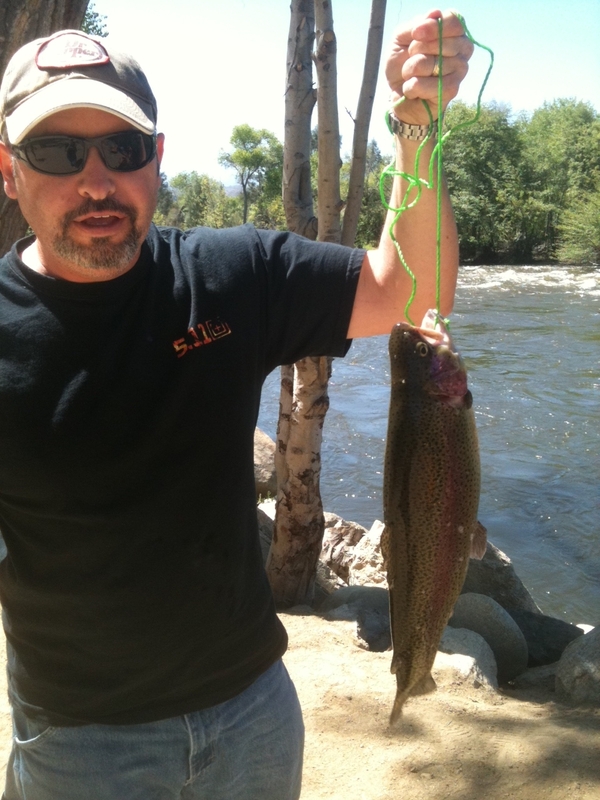 I think the highlight of the trip was the fishing, the Kern River is known for Rainbow Trout and there are a few fishing competitions during the year. They stock the river and Lake Isabella (downstream) on a regular basis so fishing right off the bank is fantastic. The family and I used rod and reel with salmon eggs. The fish below was just under 4 lbs, probably the biggest rainbow I have ever caught (photo below). We caught a lot of 2 lb.+ trout during the week as well. The campground has a fish cleaning stand, with sink, scale and disposal right near the office so it made cleaning the fish really simple. I would highly recommend Camp James Campground for a weekend getaway or longer stay, the weather was 75 and sunny every day and is a great place to just getaway and relax.